Over 80% of businesses back up their data daily and over 50% of employees who back up company data misconfigure their backup software, resulting in costly downtime that would have been avoided if they had invested in an effective data protection solution. Share this Calculation with a colleague (and save a copy for your records). If you check the box, RenovoData can call you back within 24 hours to determine how much we can save your business. Check if RenovoData may contact you. RenovoData solutions can provide you significant savings by costing you less, reducing your downtime, and enabling you to meet the data protection and confidentiality standards of highly regulated environments. RenovoData’s Backup in a Box solution will save you money and precious time from day one. Choosing RenovoData eliminates the need for multiple backup solutions for local disk-to-disk and offsite backup requirements, and the need to invest in costly technology infrastructure if you choose one of our Managed Services. 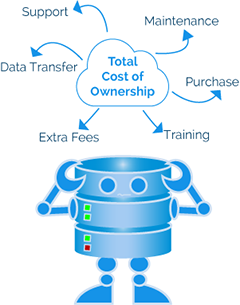 If you would like to determine actual savings for yourself, apply for a FREE TRIAL to Trial 100GB’s of RenovoData's Cloud Backup Service FREE for 30 days. For more than 100 GB's, or if you need to test longer than 30 days, just contact one of our representative and they will be happy to assist you. What is the rate per GB? Is the rate per GB calculated on “compressed” data, “native” data or “protected” data? Does the rate per GB include data deduplication or do you pay for multiple versions of each file? Is there a “per server” or “per computer” fee in addition to the rate per GB storage fee? How about a requirement to purchase an appliance or equipment? Is there a software maintenance fee? Is there a support fee or is support included? Are there any extra charges for restores? Do you have to pay any data transfer fees in or out of the cloud? Is there a need to purchase removable media, like tapes or hard drives? If yes, how many do you need to provide acceptable “roll back” capability? How much time (in hours) will you be spending each month on managing the solution or changing removable media? To learn more about how RenovoData can simplify your backup costs, speak to one of our Cloud Services Consultants.